Join us as we embark on the C-IMAGE research vessel, Weatherbird II’s August 5-12 voyage into the Gulf of Mexico. I am blessed to have been selected for this opportunity to implement learned skills from our GLOBE and B-Wet/NOAA trainings. 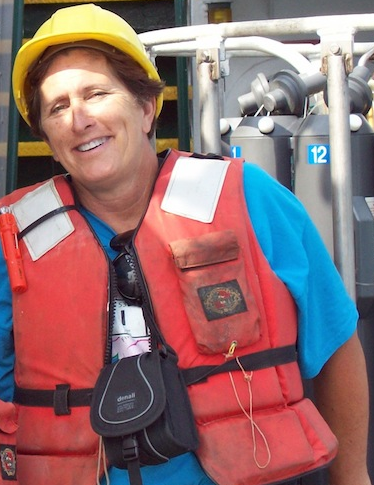 (the second teacher is E. McCormack) Thank you Dr. Greely, USF Marine Scientist. In this digital age, most anything that you want to know about me is available through a Google search- accreditations, certifications, professional accomplishments, etc. On my flicker account, you’ll find hiking, paddling, and cycling photos from numerous National, State and local parks. On my Facebook account, you’ll find connections to my former students and fellow educators as well as my two grown sons. You’ll also find my favorite books and music. On my LinkedIn account, you’ll find professional connections for workshop facilitations, curriculum writing and formal academic ventures. On the FLDOE site, you can find my certifications, my involvement with the Next Generation Science standards, FCAT Item review, and Content Advisory Committee. On YouTube, you’ll find us in our usual learning setting because the New York Times asked us to share. What you will not locate through this research is my passion for inquiry-based learning. Learning is at the very heart of each sunrise, each encounter and experience. Inquiry encourages students to formulate questions and pursue those questions through experimentation and research. This school year, my twentieth year, I will be working with eighth grade students at Dr. John Long Middle School in Wesley Chapel- north of Tampa. Our curriculum is focused on basic chemistry and the interrelationships of bodies in space. Talk about a natural fit for integrating the C-IMAGE venture! “I only know what I know” is a what my workshop partner reminds me. We each experience learning through our own “lens”. As a Navy brat, I filter my experiences through a lens of diversity and flexibility . Adaptability is key. Perhaps, that is why I am not satisfied with isolated knowledge, but rather focus on the interrelationships of systems and content. Being selected as a C-IMAGE Teacher at Sea for the week of August 5-12 is an incredible opportunity for me. I look forward to sharing my learning and collaborations as true science is conducted. Print article This entry was posted by greely on August 2, 2013 at 7:09 am, and is filed under Oceanic Updates. Follow any responses to this post through RSS 2.0. You can leave a response or trackback from your own site. What a great opportunity for teachers to bring back real world knowledge to students! This is SOOOOO cool. Just finished my first shift of water analysis— took almost 3 hours at our FIRST stop. Next stop is at 0500. Gotta get some sleep!